#DemiLovato breaks silence! 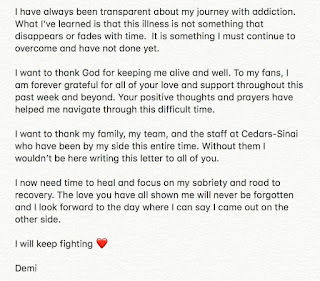 Releases statement on overdose as she prepares to head to rehab..
Demi Lovato is getting out of a rough patch having been found in a critical condition after an overdose. She is getting better and has released a statement on more steps she is taking on the road to recovery. All the best to you Demi!